This data set provides a single raster image containing the spatial distribution of aboveground live forest biomass of the Amazon basin. This product was derived using a methodology based on a combination of land cover map, remote sensing derived metrics, and more than 500 forest plots distributed over the basin (Saatchi, et al., 2007). The distributed map was produced in ENVI in Tiff format and contains forest biomass divided among 11 classes at 1 km spatial resolution with reasonable accuracy (better than 70%). Remote sensing and ground data used in this product were collected from 1990-2000. The Biomass map represents average biomass distribution over the Amazon basin over this period and was used to estimate the total carbon stock of the basin, including the dead and belowground biomass. combined DTM and regression analysis with 11 biomass classes and overall accuracy of 88%. Saatchi, S.S., R.A. Houghton, D. Alves, B. Nelson. 2009. LBA-ECO LC-15 Amazon Basin Aboveground Live Biomass Distribution Map: 1990-2000. Data set. Available on-line [http://daac.ornl.gov] from Oak Ridge National Laboratory Distributed Active Archive Center, Oak Ridge, Tennessee, U.S.A. doi:10.3334/ORNLDAAC/908. This data set was archived in January of 2009. Users who download the data between January of 2009 and December 2014 must comply with the LBA Data and Publication Policy. To determine the spatial distribution of forest biomass of the Amazon basin, we introduce a methodology based on spatial data, such as land cover, remote sensing metrics representing various forest structural parameters and environmental variables, and more than 500 forest plots distributed over the basin. The distributed map in Tiff format contains forest biomass divided among 11 classes at 1 km spatial resolution with reasonable accuracy (better than 70%). Remote sensing and ground data used in this product were collected from 1990-2000. The distributed map in Tiff format contains forest biomass divided among 11 classes at 1 km spatial resolution. Remote sensing and ground data used in this product were collected from 1990-2000. LC15_amazon_biomass.tif, is a Tiff file, coded with values 0-11. LC15_amazon_biomass.dsr, is an ascii file that has the rgb combination for each data value 0-11, also known as an ENVI Density Slice Range file. LC15_amazon_biomass.tfw, is an ascii file which contains the transformation information: pixel x size, rotation around the y axis, rotation around the x axis, pixel y size, x of the upper left pixel, and y of the upper left pixel. LC15_bounding_coordinates.txt, is an ascii file containing the spatial content of the Tiff. The spatial reference for this Tiff is defined as geographic coordinate system WGS_84 and the cell size is 1km. It is worth noting that the data values don’t actually correspond to above ground biomass estimates, but are the the 11 categories as shown in the Figure 1 legend. The data set covers the period 1990/01/01 to 2000/12/31. Results show that AGLB is highest in the main Central Amazon and in regions to the east and north, including the Guyanas. Biomass is generally above 300 Mg/ha here except in areas of intense logging or open floodplains. In the Western Amazon from the lowland regions of Peru, Ecuador,and Colombia to the Andean elevational gradients, biomass ranges from 150-300 Mg/ha. Most transitional and seasonal forests in southern and northwestern edges of the basin have biomass ranging from 100-200 Mg/ha. The AGLB distribution has a significant correlation with the months of dry season and the annual mean rainfall patterns across the basin. We predict, the total carbon in forest biomass of the Amazon basin, including the dead and belowground biomass, is about 86 PgC with uncertainty which compares in magnitude with the range of carbon predicted by other models. The Biomass map represents average biomass distribution over the Amazon basin over this period and was used to estimate the total carbon stock of the basin, including the dead and belowground biomass. Saatchi et al. (2007) discuss estimates of the accuracy from crossvalidation, and sources of errors and uncertainties in the biomass classifications. For spatial accuracy, two general features were apparent: (1) Accuracy varies with biomass. Areas with less than 150 Mg/ha biomass usually have more than 80% accuracy in biomass, although the accuracy is less in some areas of old secondary forests and dense woodlands, where biomass ranges from 100-150 Mg/ha. (2) The spatial accuracy varies within each biomass class depending on the type of vegetation or the characteristics of the remote sensing data. For example, within one biomass class, areas with higher elevation and ruggedness had relatively less accuracy than areas with flat topography. What are the environmental variables responsible for the magnitude and distribution patterns of biomass density over the basin? Uncertainty remains as to how accurate are ground measurements of biomass over the basin. In this study, we did not address the errors associated with the aboveground biomass of forest plots. In the future, uncertainty might be reduced by improving the spatial resolution of data layers. This question might be tested by incorporating all available high resolution satellite imagery and employing a multi-scale approach for estimating or extrapolating biomass. One of the main sources of uncertainty in our study was the discrepancy between the resolution of images and the size of the forest plots. The spectral information obtained from 1 km resolution data is unlikely to represent the plot biomass or structure. By incorporating images at 30-100 meter resolutions, we may be able to locate the plots directly on the images and remove location uncertainty, to incorporate surface heterogeneity in our calculations, and to improve the separation of the anthropogenic landscapes from forests. By using a multiscale approach, a final biomass map of 100 m resolution, or finer, might be produced. The investigators used a new method of extrapolation over the Amazon basin. By collecting data from a large number of biomass plots in a variety of forest types distributed over the basin, and by using remote sensing data sensitive to forest characteristics and environmental variables, we develop a series of metrics for extrapolating the plot data to the basin. The approach combines the strengths of both forest plots (limited in spatial coverage but providing accurate measurement of biomass) and remote sensing data (less accurate in measuring biomass directly but covering the entire region). The spatial resolution is 1-km. To cover the wide range of biomass values across the basin, we considered all vegetation types present: old growth terra firme forests, floodplains, woody and herbaceous savanna, and small forest patches along the eastern Andes and Atlantic coast. We also included the most recent land-cover map of the region (1 km resolution) in order to separate undisturbed vegetation from the ecosystems modified by human activities (secondary and degraded forests). The region of study includes all vegetation types in South America between 14 degrees N and 20 degrees S latitude. The list of biomass plot data used in this study with general locations, number of plots, vegetation types, and sources was listed in Saatchi et al. (2007). In this study, we identified and collected data from 544 biomass plots sampled in different vegetation types throughout the basin. The data from majority of these plots were not published in literature and were contributed to this study by individual investigators. The general information about the plot size, vegetation cover, geographical region and the name of the principal investigators and the dates for available publications, reports or date of the data collection are provided in the table. We would like to thank the following scientists who shared the biomass plot data with us: Bruce Nelson(INPA, Brazil), Dirk Hoekman (Wageningen Univ., The Netherlands), Marcela Quinones (Wageningen Univ., The Netherlands), Richard Lucas(University of Wales, UK), William Laurance (Smithsonian Institute, USA), Marc Steinenger (Conservation International, USA), Emilio Moran (Indiana University, USA), Eduardo Brandazio (Indiana University, USA), J.R. Santos (INPE, Brazil), Diogenes Alves (INPE, Brazil), John Terbourgh (Duke University, USA), Nigel Pitma (Duke University), Miles, Silman (Wake Forest University) J.J. van der Sanden (Wageningen Univ. The Netherlands) , Timothy Killeen (Conservational International, Bolivia). The overall approach was to determine relationships between remote sensing metrics and AGLB from forest plots, and use these relationships directly to estimate AGLB over the entire Amazon basin. A decision tree approach was used to develop the spatial distribution of AGLB for 7 distinct biomass classes of lowland old-growth forests with more than 80% accuracy. AGLB for other vegetation types, such as the woody and herbaceous savanna and secondary forests, was directly estimated with a regression based on satellite data. Saatchi, S.S., R.A. Houghton, R.C. Dos Santos Alvala, J.V. Soares and Y. Yu. 2007. 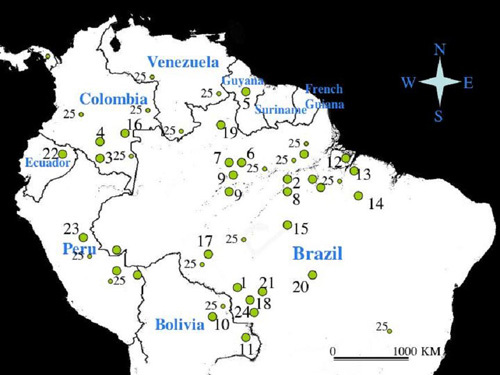 Distribution of aboveground live biomass in the Amazon. Global Change Biology (2007) 13, 816-837,doi: 10.1111/j.1365-2486.2007.01323.x. Saatchi, S.S. 2007. Projects in the Amazon Basin - Basin Wide Studies. Web page. Available on-line [http://www-radar.jpl.nasa.gov/carbon/ab/bws.htm] from Jet Propulsion Laboratory, California Institute of Technology Pasadena, California, U.S.A. Accessed March 10, 2008. Saatchi, S.S., R.A. Houghton, R.C. Dos Santos Alvala, J.V. Soares and Y. Yu. 2007. 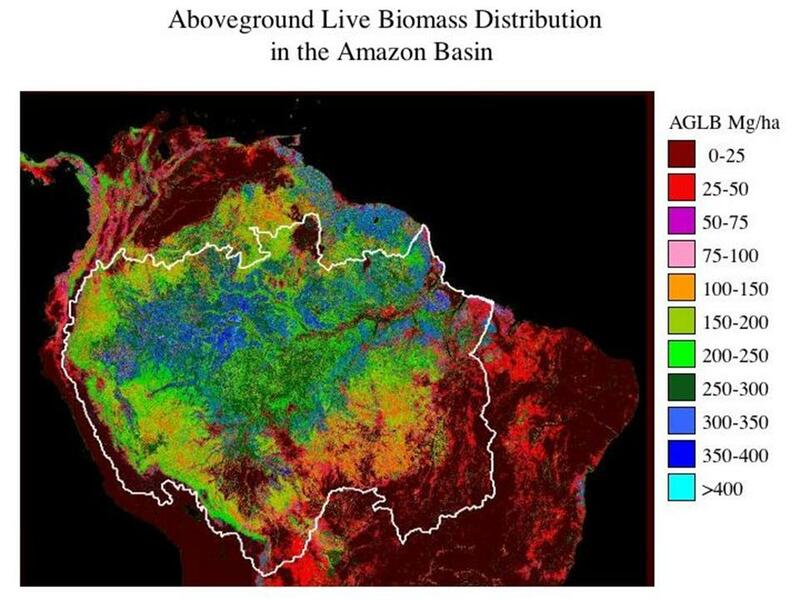 Distribution of aboveground live biomass in the Amazon. Global Change Biology (2007) 13, 816-837, doi: 10.1111/j.1365-2486.2007.01323.x.